We added a quick toss to our offense this season. It became a wildly explosive play for us averaging just over 10 yards per carry. We try to overload the defense on the perimeter by pulling multiple offensive linemen to the perimeter and using angle blocking for our WRs to stop inside pursuit of the play. This is a great play for us to get our RB outside and away from the loaded boxes we see. We will run this play the exact same from Pistol and with the RB off set to the side of the QB. All of the blocking rules, drill video, and cut ups with my voice over are included in the iBook. Here is a sample of the toss play I detail in the iBook. In the next preview of the schemes I discuss in my new iBook I will be introducing our RB Buck play. Our Buck a RB version of the buck sweep. It was the biggest addition to our playbook this season and we averaged over 10 yards per carry on it. In the iBook i detail multiple ways we seal the edge and pull our guards to lead block for this sweep that can hit anywhere from the alley to the sideline. I re use many of the skills we work on in our power and counter schemes and it gives us a great answer for team who are defending those schemes well. This is a play that has become a huge part of Auburn’s success running the football. Here is a clip of our buck play that begins looking just like power, and then pops out to the alley for a big gain. Posted in CoachBDud Material, College Film, Offense, Offensive Line, Run Game. In the next little preview for the schemes I am writing about for my iBook I will discuss the Stretch or Outside Zone scheme. This play is always a big part of our offense and is very simple for us to install and run. We use a full reach scheme that stays the same for the OL regardless of personnel and formation. That is what I like about the play… we can run it a number of different ways. This play can hit ANYWHERE across the front. We get so much lateral movement that creases can open up anywhere and our RB’s have done a great job at running to daylight on it. Here is a clip of our stretch scheme from pistol. Once Power is installed the next part of our offense to go in is Counter. We were actually significantly better running Counter this season and I called it more frequently, with more success, than our Power scheme. We often see an extra player or two to the side we set our Fullback so being proficient at Counter going back the other way was critical to our offensive success. Playside down blocks/doubles just like Power. We pull the backside guard to kick out the end and have different calls to pull our FB, backside TE, a wing, or any combination thereof . I prefer keeping the backside tackle home to block backside rather than the traditional “GT” or “Counter trey” that uses the backside tackle as the 2nd puller (2nd puller is the player wrapping up to LB). This keeps the tackles rules and skills consistent between power and counter, helps in mastery of our backside B gap hinge technique, and allows us to pull a better athlete (FB/TE/Wr). Below is an example of us running it both from our Pro set, and from out double tight set. Posted in CoachBDud Material, Offense, Offensive Line, Pro, Run Game. I run a power based offense at my high school. I am stubbornly committed to running the football and everything is based off of our 2 back Power Scheme. I have started working on an eBook series detailing how I teach our run game and I wanted to include a little bit on my blog so anyone who might be interested in it can get a glimpse of what they will be learning about. Power is the foundation of our offense. I teach a standard 2 back power with down blocking or doubles at the Point of Attack, a Fullback Kick Out on the end man, and a backside guard wrapping through to the playside LB. Everything else in our offense comes off of us being able to establish our 2 back power play. Here is a sideline and EZ shot of a 2 back power play from this season. We get downhill now with everyone inside picked up and put the RB 1on1 with a FS on the Goal Line. That is going to be a win for the offense just about every time. Later this week I will be posting clips of our Counter, Bucksweep, Stretch, and Toss plays that will eventually all be part of the eBook series. I just wanted to announce that I am working on something big over the next month or two that will come out some time in 2016. I lay out exactly how I teach and drill our 2 back power scheme (the foundation of our offense). These plays accounted for of our school record breaking 4,416 yards rushing this year. We led our section (large school division) in rushing yards per game, total yards per game, and scoring per game. I am blessed to coach an insanely talented group of kids, but I think we do some really good things offensively that utilize that talent. I will be working again with Coach Grabowski and the guys at Coaches Edge to bring my written explanations, diagrams, step by step drill video, and game cut ups to coaches on their electronic devices. With the previous content it was only accessible as an iBook on an iPad. I believe the new series will be on a new format that will allow you to view it on any computer/tablet device. Posted in CoachBDud Material, Offense, Offensive Line, Technology. 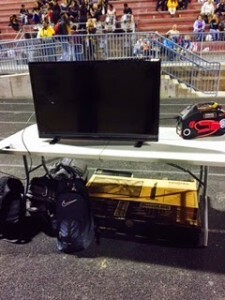 Before the 2013 season, NFHS lifted it’s ban on using technology on the sidelines. Since the 2013 season, we are all allowed to use any sideline technology we want (we just can’t take it past the numbers or beyond the 25s). I began taking advantage of lifting the technology ban this season. I had seen a few different companies that offered replay systems and ended up emailing SkyCoach, and asked for a trial. I was intrigued by SkyCoach because it had less equipment than other systems I had seen. Their system relies on iPhones to film with, and your cell signal to upload and download the clips. I am a big apple fan (iPhone, iPad, and MacBook user) and I know that most of our kids have iPhones. Some coaches have concerns over cell signal strength and upload/download speed. I didn’t have any connection issues in any of the stadiums we played at. You can use a free app called Ookla to test download and upload speed. Pretty much anywhere is going to have fast enough download speed, just need to make sure upload speed is at least 1.0 MBPS. Every stadium on our schedule was well over this number. A case with a magnifying lens attaches to one iPhone to get a tighter view of the play. I would have my TA film the games from the press box, and I would auto download them onto my iPhone in my pocket on the sideline. You could have infinite iPads or cell phones logged in looking at the clips (clips are easy to sort and filter by O/D/ST, by series, by play type etc.). What I chose to do was pick up a TV, and have my players and myself watch in between drives. You can find generic brand flat screen TVs for really cheap, and I got some adapters (iPhone 5/6 to HDMI) that you can find at any electronic store to connect the iPhone to the TV. If you have power in the stadium you can run an extension cord, or use a car battery, or buy a portable battery pack like I did. My game day sideline set up looked like this. I would review the film each drive and have any of my kids not in on defense reviewing with me. I found this to be a tremendous resource for me as an OC. It definitely helped with play calling, making adjustments, and fixing our mistakes. I think this is a more valuable tool than talking to a coach up in the booth. The guy in the booth can only spot one thing at a time, with this I can rewind the play as many times as I need to in order to see every position on the field. I can also pause it at the snap and see the exact alignment of every defensive player to each of our formations. I am not a SkyCoach employee, but I got to use this technology this year and I absolutely loved it. I have shown this technology to a few schools in my area since our season ended and they have seen what an advantage it can be. One knock on SkyCoach was the price ($1500 this season) but the 2015 pricing is down to $1095. That is a good chunk of money but this is a resource that can add a few wins to your season, and I think having easy instant replay on the sideline seconds after the play is worth one or two extra summer car washes to raise the funds. Posted in CoachBDud Material, Technology. Recently I have really gotten in to fitness and nutrition. I don’t plan on being a body builder or anything, but I value looking and feeling good. I have done any polling or research into our profession, but just from staring at teams’ sidelines… there is a large percentage of football coaches who are overweight. When I was 21 I made some big changes in my life and I dropped a total of 90 lbs from my biggest down to my smallest. I wrote about that here. I no longer care about the number on the scale, I only care about how I look from working out. I want to share some pieces of advice, simple things that you can do to help yourself lose weight. We are still in January, the month where everyone vows to drop those extra pounds. However most people that start a new years weight loss plan, give up within a month or two. I won’t get into working out… do something you like… do it often. Burn Calories. For me, I enjoy lifting. I hate cardio. If I want cardio, I will lift weights faster. But that is just me, do whatever makes you happy. We spend hours of time every week breaking down film, preparing for opponents, and organizing our team. We can spare an hour per week for meal prep. I have a whey protein shake every day post workout as well. I have other snacks at times, or I will switch a meal up… but these foods are fairly constant in my day to day eating. The are multiple benefits in mass preparing all your foods. 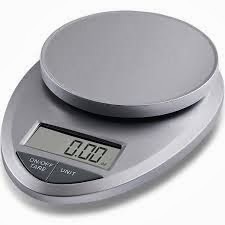 A digital food scale. I picked one up a couple years ago. You can get them for $20 or less on amazon, walmart, or target. A Calorie counting App – The best in my opinion is “My Fitness Pal”. I have tried others, but this one is the best. You just type in the food and it has everything you can think of in it. You just adjust the serving size to enter how much you ate. It even has a scanner function. You just hold it up to the bar code of any food and it will automatically input the food’s data. I’ve seen it work on dollar store brand items. it has everything programmed in there. Using the app is where the food scale comes in handy. It allows you to measure what you are eating so you can enter the data into your phone. You can’t expect to get solid weight loss results until you begin tracking your calories (and macronutrients). What some people might think is a serving of a particular food might actually be 2-3 servings. The app is awesome because you can enter in some info about yourself and it tells you how many calories to consume in order to reach your goal. When I want to lose fat I choose the 1 lb per week goal, which will give a 500 calorie deficit per day. 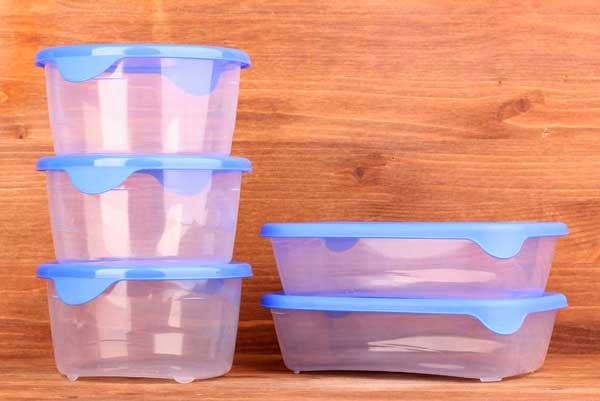 TupperWare to store your food in. I bought most of mine from the dollar store. I have no idea what size they are but they are big enough to fit each meal, stackable, easy to clean and reuse, and they were cheap. Buy a decent amount of them, since you will be prepping probably 3-4 meals per day for 5-6 days at a time. I am able to get my cooking done quickly because I do it all at once. A typical Sunday evening looks like this. BBQ or oven cooking chicken, boiling pasta on stove, while cooking eggs/turkey sausage on another burner, while my rice cooker is doing its thing making rice for the week. Once all of the food is cooked I use the scale and Tupperware to divide the food out evenly into packaged meals and stack the meals up by which day I will eat them. I try to add as much flavor to my food without adding extra calories, recently I have shifted away from eating anything with sodium in it as well. A lot of what I eat is high in sodium so it is important for me to not add any. Since you other coaches are like family to me I will let you in on my secret recipes. I add spices to almost everything… they are zero calorie, and have zero sodium… literally if you look at the nutrition facts they all say 0 for every category. 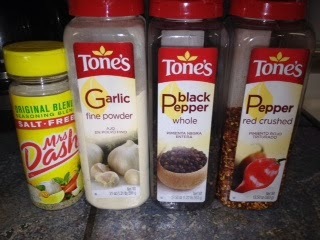 These are my go to seasonings. I got all of these at Sam’s Club (just like Costco for anyone who isn’t familiar with the warehouse store). I love the taste of pepper. I love anything spicy and feel the crushed red pepper helps to give otherwise bland egg whites some needed flavor. My mom used garlic salt on everything growing up so garlic powder is my no calorie/sodium way of replicating that taste in my food. If I could only pick one seasoning it would be Mrs. Dash. Mrs. Dash has a wide range of flavors and the good thing is that now ALL of their products are salt free. I recently purchased the chipotle version and I like that as well. It tastes good on everything. I can’t imagine cooking without PAM. Makes clean up much easier because food doesn’t stick. No need to cook food in oil or butter when you can use PAM and add ZERO calories to your meals. Hippies will tell you they are bad for you and aren’t natural. However there a number of zero calorie foods you can experiment with. Walden Farms produces nothing but zero calorie foods. ZERO (that’s 0) calories and I have heard it tastes just like butter. 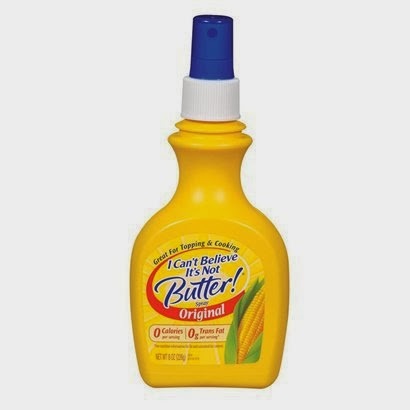 Ideal for putting on potatoes/toast/ anything else you might like without adding all of the fat and calories of butter or margarine. Give it a shot. You do not have to eat any of the foods I mentioned above. However I promise you, give meal prep a try for a month and you will see results. It seems like a lot of work to do up front but I assure you it saves time compared to cooking food each day of the week. If you get bored with food easily pick out a few breakfast meals, a few lunches, a few snacks, a few dinners and this way you can change it up. Give this a shot. We all want kids that are in shape and take care of their bodies… don’t they deserve a coach who does the same? Posted in CoachBDud Material, Off Season, S&C. Posted in CoachBDud Material, HS Film, Off Season. Months of hard work will pay off starting tomorrow and running through Wednesday. I have spent the last 7 months or so planning and getting things ready for this camp… It is truly my baby and it has grown into a pretty good sized camp. One of the biggest team camps in Northern CA. We are lucky to have a total of 8 very good programs participating this year. I am excited both as the camp director and as a first year offensive coordinator. We have a lot of new players and I am excited to see how they step up to the challenge. I have faith that our kids will compete and that we will move the ball offensively. My number 1 goal for camp is tempo… I am warning every other team before hand that we go fast and sorry, I know it is camp but you’re going to have to catch up. Last year at camp was our first time experimenting with fast tempo and we started killing teams we otherwise couldn’t gain a yard against. I truly believe that tempo is a great equalizer and will be our key to success this season. I know I will not be sleeping much tonight as I feel like a little kid the night before Christmas. 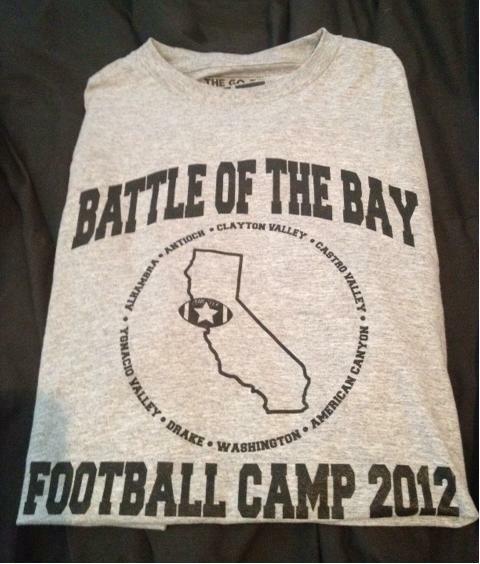 Ill definitely be writing next week about how camp went and what plays were working well for us.